Neymar Jr's first outing as a PokerStars Ambassador went extremely well thanks to a plethora of charitable donations worth $100,000. Flying into Sao Paulo for the BSOP and its special charity event, Neymar Jr was mobbed by the local media as he made his way into the casino for his very public "home game". Taking part in the event was the first in a long line of poker duties for the Brazilian, but even as the bets and bluffs flew towards him he never lost his trademark smile. Indeed, with all the proceeds from the charity event going to the Neymar Jr Institute, which helps the underprivileged in Sao Paulo, the footballer was able to sit back and enjoy his time at the felt. Playing alongside Brazilian poker pros such as Felipe Ramos and Andre Akkari, Neymar Jr was able to hold his own but wasn't able to walk away with the win despite his best efforts. However, the result was a mere side attraction to the money raised for charity which managed to top $100,000 thanks to 80 entrants and a further 40 rebuys. 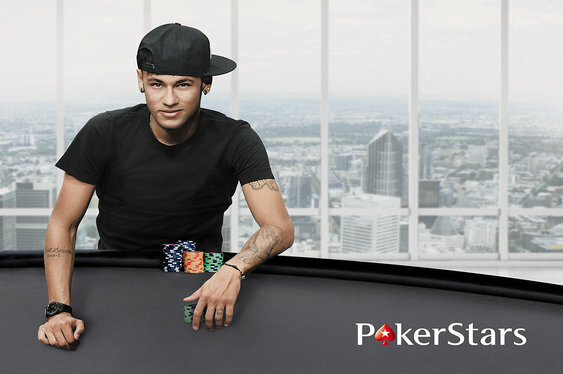 With the betting over, a busy Neymar Jr was forced to make a quick exit and head back to Barcelona for some pre-season training, but not before he proved that star power is a great way to help boost the profile of poker. Quite where we'll see him next is unclear, but if PokerStars is able to align each of its sporting stars, including Cristiano Ronaldo and Rafa Nadal, for a special all-star event, then it could not only become one of the biggest poker spectacles in recent years, but a great way to attract some highly positive mainstream press coverage for the industry.